I was waiting in the ghat to cross the river to get to the world's biggest river island Majuli. 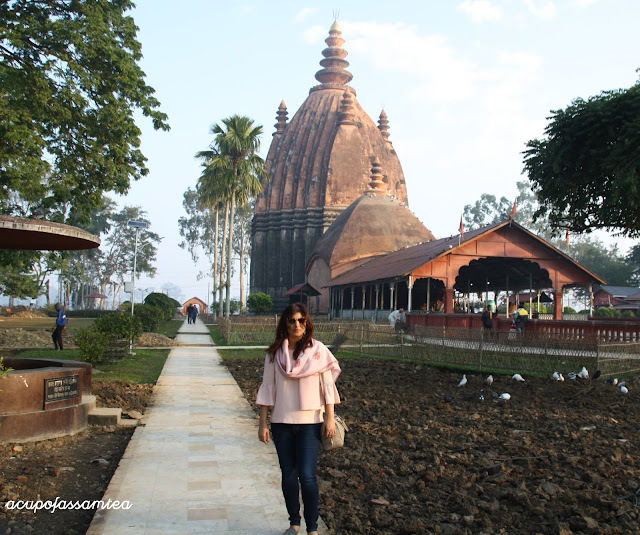 I was high on my emotion, leaving my kids with my mom and at the same time fascinated about visiting Majuli for the first time. Then a lady came and interrupted my thoughts asking about what to see in Majuli? It took me awhile to recollect my thoughts and by the time I was able to answer she had disappeared. 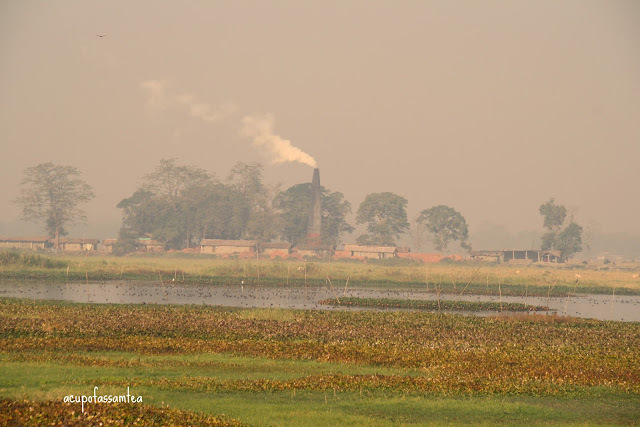 When I think about Majuli, I wonder if my words really justify the real, rhythmic and rustic as well artistic muse Majuli. When we took the ferry ride, it was entirely different than regular ferry rides. It was difficult to differentiate the difference between land and sand. After one hour ride, we got to Majuli. We visited our relative in Komalabari and after an hour was ready to explore the unspoiled land. We took our car to Samuguri about 3 miles from Komalabari. At that time the color of the crimson sky was merging with turquoise ocean blue. I sensed this world is entirely different than the world I belong to, yet I got connected immediately. As if, the dream sequences of yesteryears where time pause for a while in the simplicity and serenity of its charming little world far from the industrialization and urban spin. The road itself was a beautiful ride, numerous small ponds; dotted mustard fields full on bloom with yellow, cow grazing on the roadside, carefree childhood in the courtyard, fishermen nets and no trace of plastic bottles and polythene unlike other places in India. 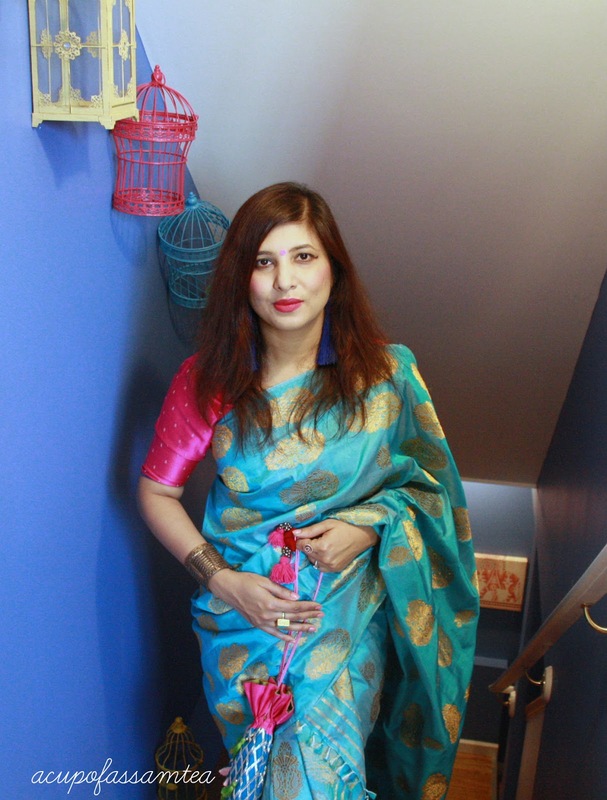 Every 1 in 3 women wearing colorful handloom wear, the whistle that is floating on the horizon from tribal villages and drum and dhol rhythms coming from the satras. 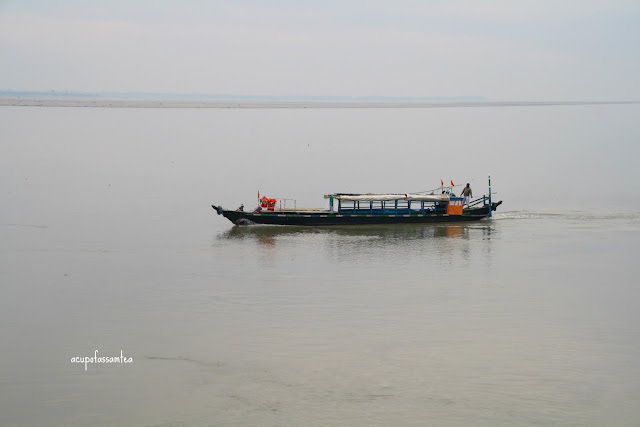 Majuli world's most largest inhabited riverine island on the mighty river Brahmaputra, Assam India. The first island district of India 135.9 square miles of land consisting of 200 villages and 22 operating satras, initially it was 65. Satras are the cultural hubs of Majuli. 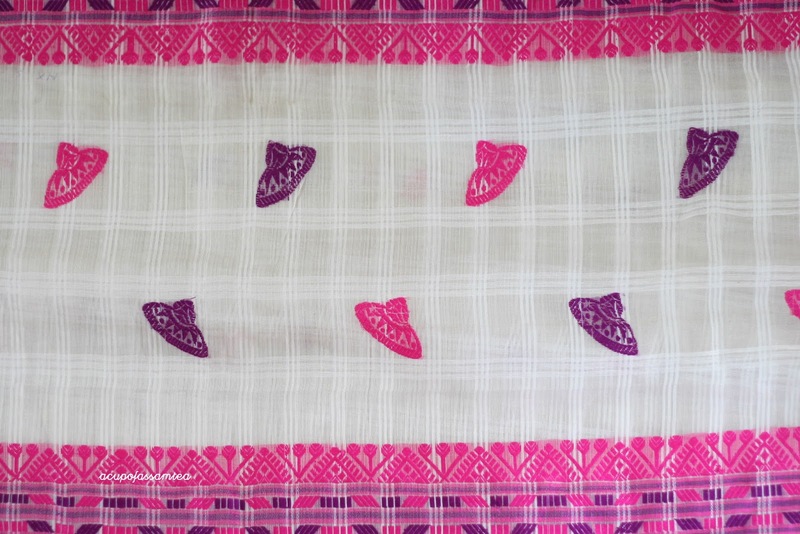 Assamese weave is one of the most breathable and delicate fabrics in the world. It is very wearable and light to carry in any season. 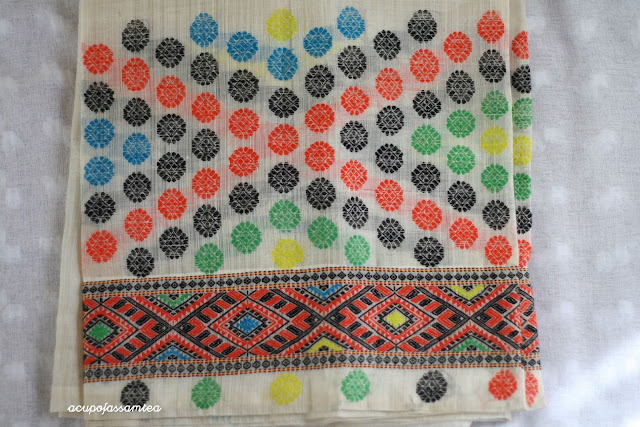 The most falcrom factor of assamese weave are the designs and motifs that add more aura and beauty to it. Today I want to share a few assamese motifs and styles. Naturally abundant Assam, Assamese motifs are also inspired by flower, tree, bird, and animals. 1. 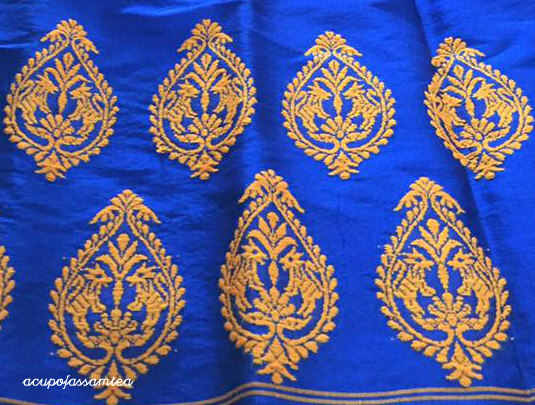 Kinkhap - The most popular adorned motif in the assamese weave, very regal and resplendent. 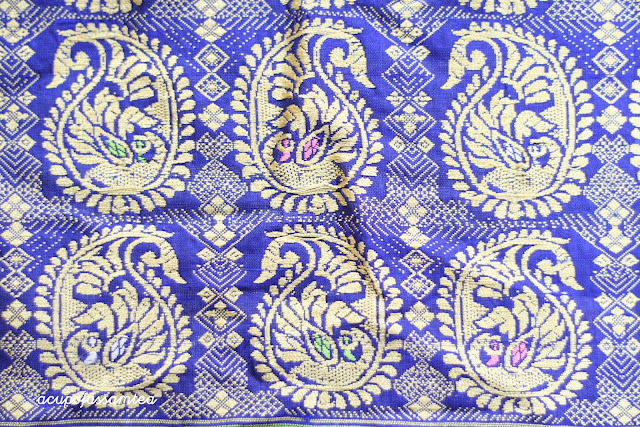 Traditionally Kinghap motifs weave in gold and silver thread but today you can get it in any thread. It is believed that this design arrived in Assam from Ahom dynasty. The kinkhap designs consist of two lions facing each other with courage. As Ahom hailed from Thailand, this design got inspired by Thailand. 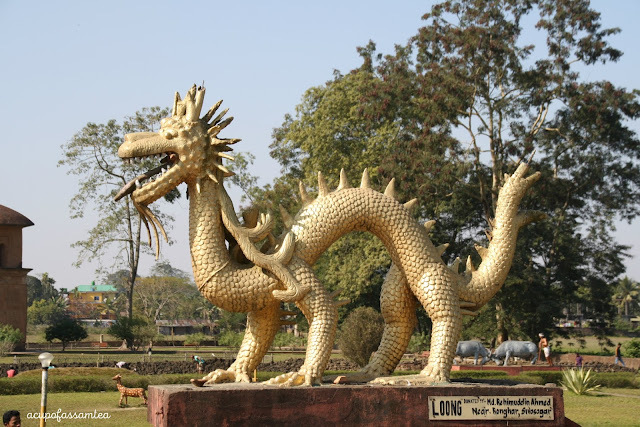 Also, Kinkhap symbolizes Ahom dynasty's brave, courage and royalty. There are many who also believe that the word Kinkhap came from China. 2. 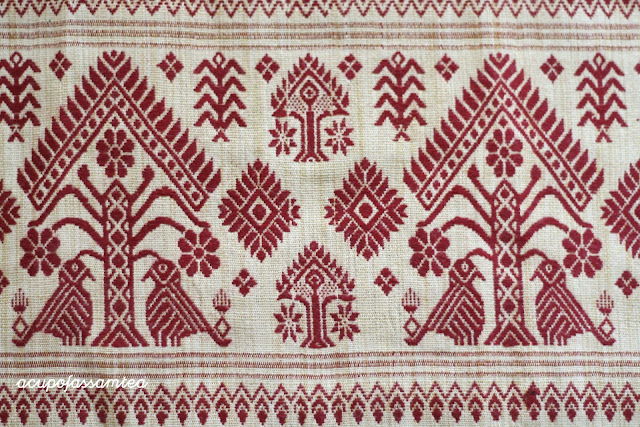 Gos buta or tree motif - This is one of the most prevalent motifs in Assamese weave. Two bird facing each other in one tree and the top part triangle. 3. 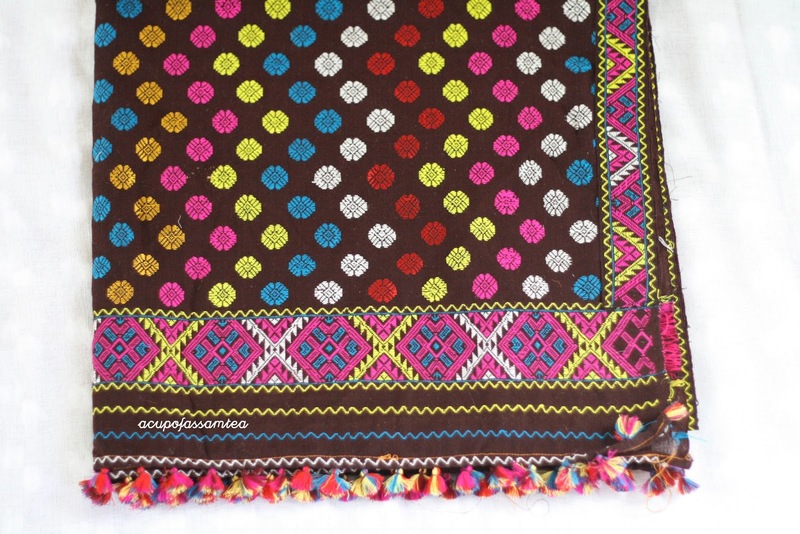 Kolka or parsley - This is one of the most popular and contemporary design found is the assamese weave. In today's modern weaves you can see modified versions bigger in size. It can be found in any other Indian waves too. 4. 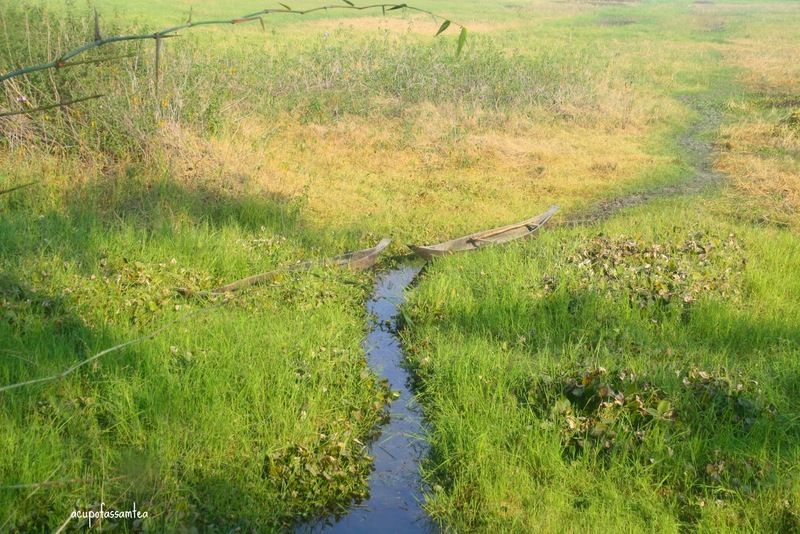 Japi and Pepa - Assamese culture is hugely dominated by farming culture. A japi or Assamese umbrella is typically worn by Assamese farmers. This japi or Assamese umbrella is adorned with Assamese weaves too. Pepa is an assamese instrument plays during Bihu(New Year). You can see this design in assamese weave too. 5. Mishing Design or motif - Mishing is one of the largest tribe in Assam. They are known for their oppulant weaves. 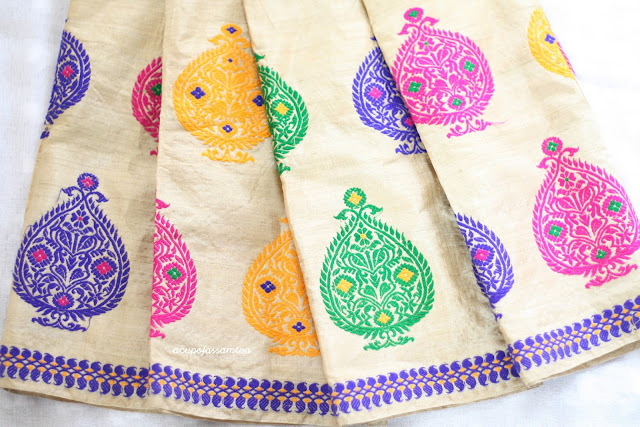 Mishing designs are Rhapsody of color in small motifs traditionally weaved in cotton fabric. Utterly offbeat and witness to 6oo years of riots, revolves, changing political scenarios and one of the tremendous cultural hub of the east with fluid architecture and the city of lakes, yes it is Sibsagar. 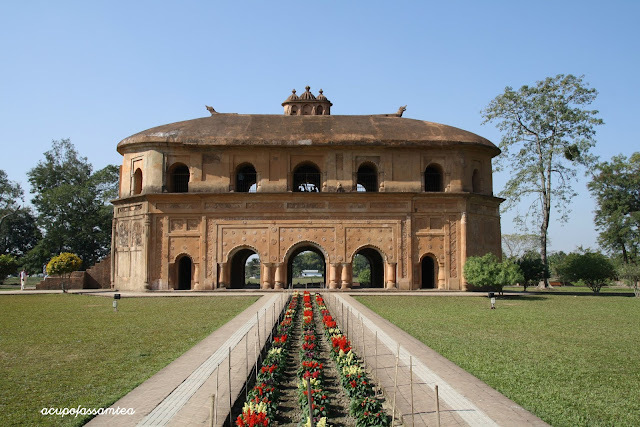 Built in 18th century by Ahom dynasty, tucked away in the fertile bank of Dikhow river Sibsagar, in the mist of green forest and dusty roads, the city intrigued you every bit. Entering here you fall for the finest fables of yesteryears. 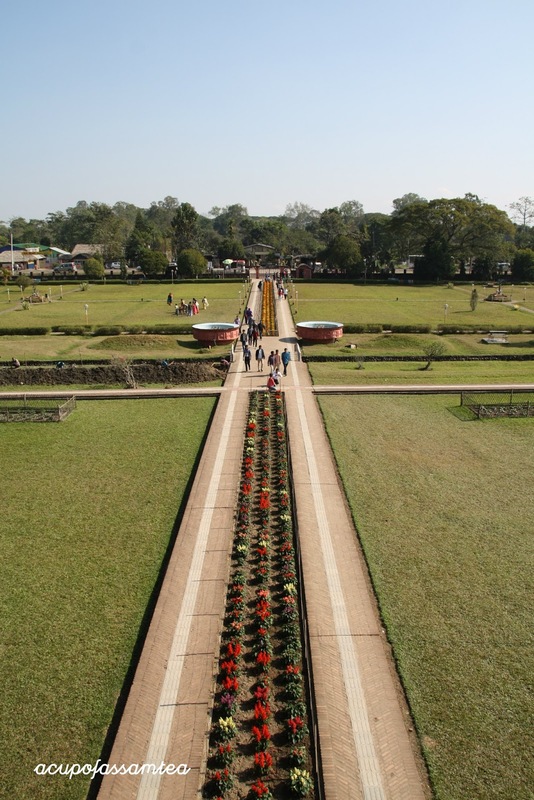 A day is not enough to explore this historic city but will get you a glimpse of the vast might of the Ahom kingdom. 1. 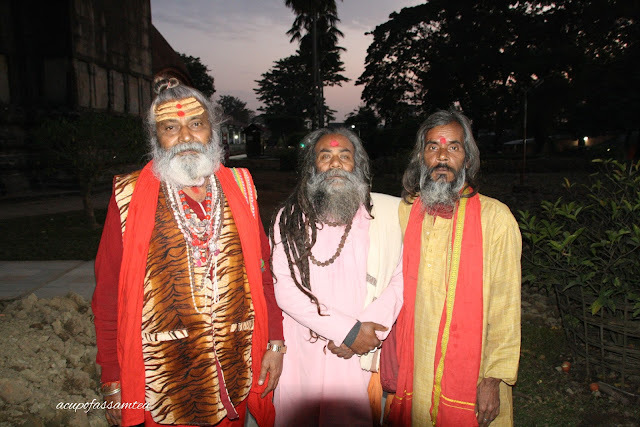 Shiva Dol - Whether you are an avid devotee or audacious traveler, Shivdol will hook you in no time. 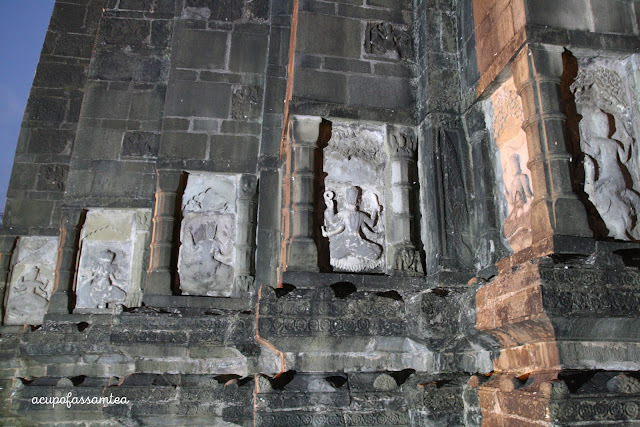 Located in the heart of the city consisting of the main Shiva dol and two relatively small Vishnu dol and Devi dol. 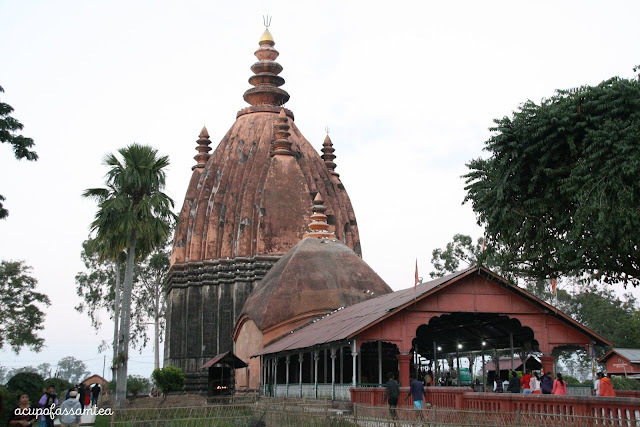 Dol means temple in the Assamese language. 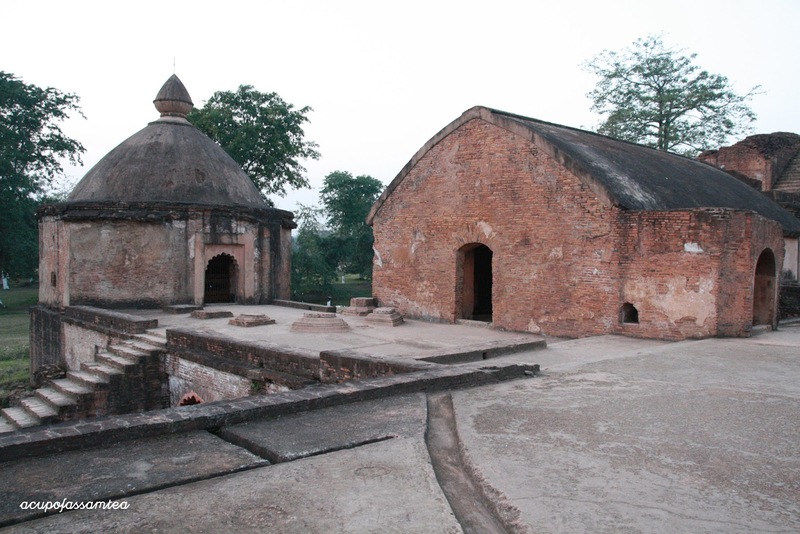 Built-in 1734 by queen Ambika wife of Shiva Singha, Ahom king. 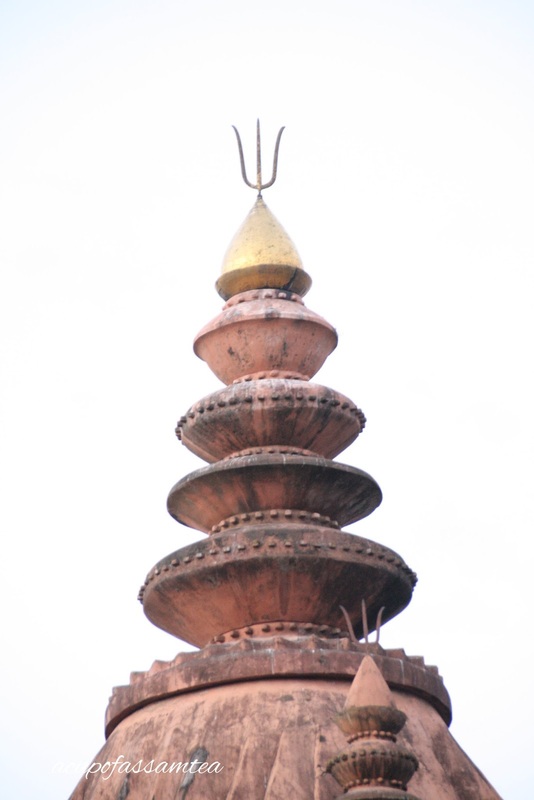 The dome-shaped Shiva dol had a kolosi (vase) of pure gold at the top. In British era, however, it was brought down and replaced with gold plated one. 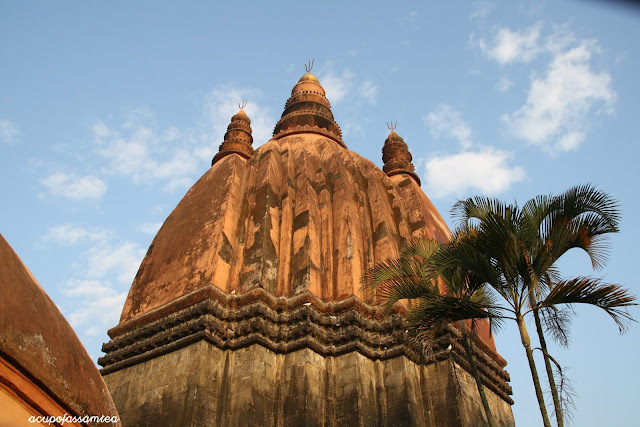 Believed to be highest shiv temple in India, Shivdol is 104 feet high, and a thousand devotees visit and pray every day. If you walk around don't be surprised to bump into those long-haired and bearded pilgrims. 2. 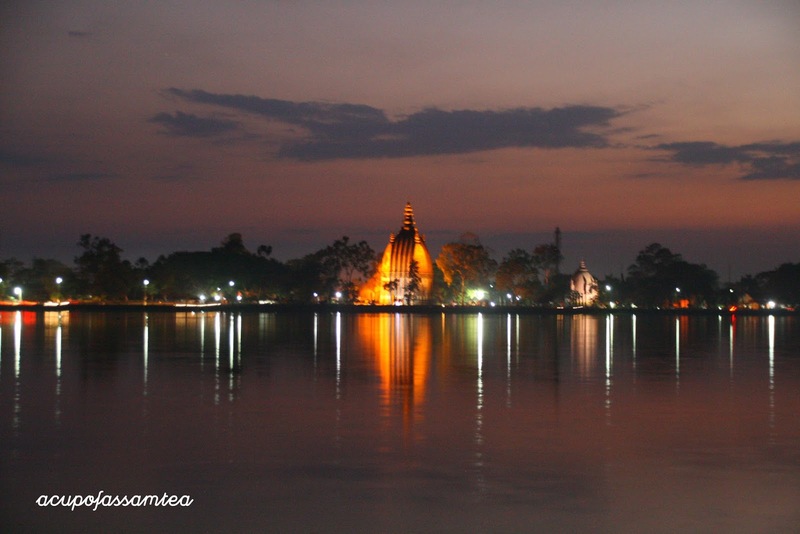 Sibsagar Lake or Borphukuri - Sibsagar is known for its all man-made lakes. 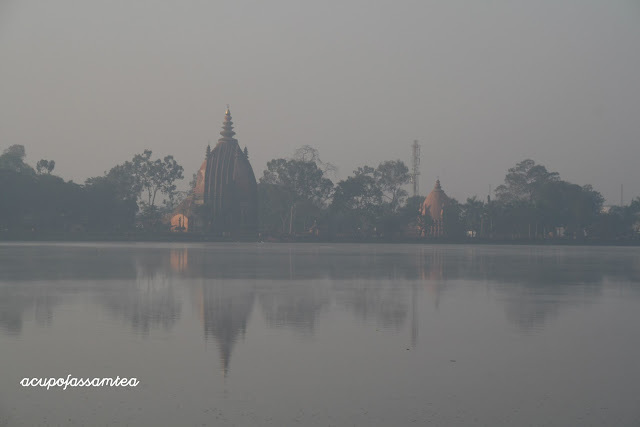 Sivasagar lake just a walk away from Shiva dol. Not very pristine but its rich history will intrigue you. If you visit in the morning, you can watch several birds and people pay a visit to feed the fish as well. This 257-acre lake's water level remains above ground level throughout the year. 3. 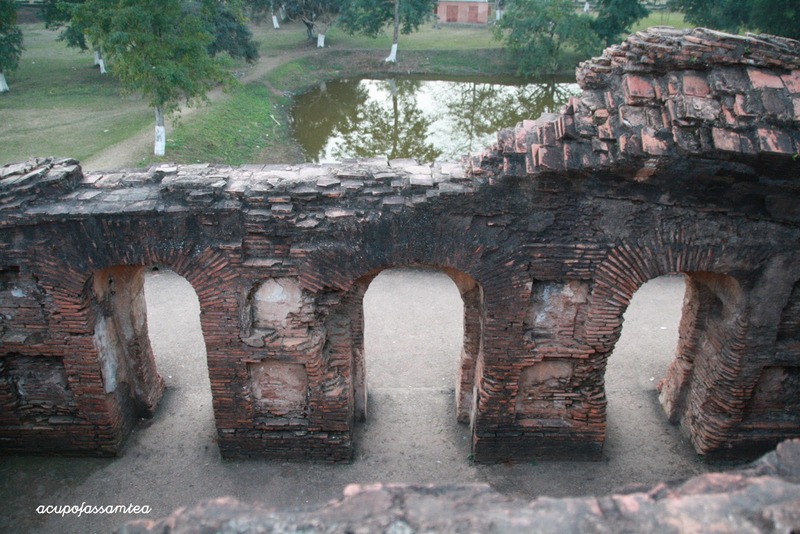 Ranghar - The Coliseum of the east. Its opulent architecture, Unique, and aesthetically carved Ranghar can't be missed. Ranghar stands for a house of entertainment. 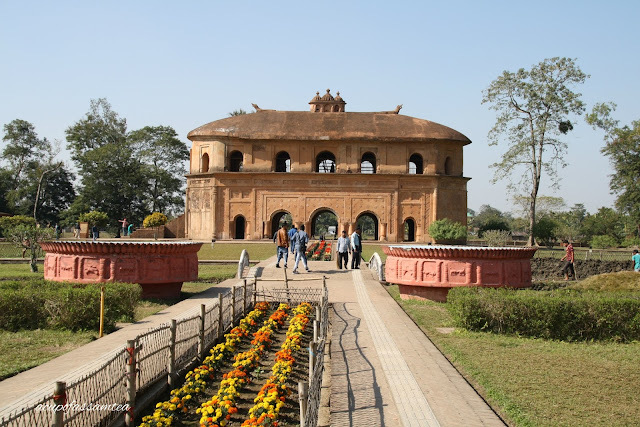 Once it was Ahom kings sports pavilion used to witness the fantastic bullfights, elephant fight, wrestling, Bihu and several other entertainments. Its courtyard is known for celebrating numerous assamese festivities. 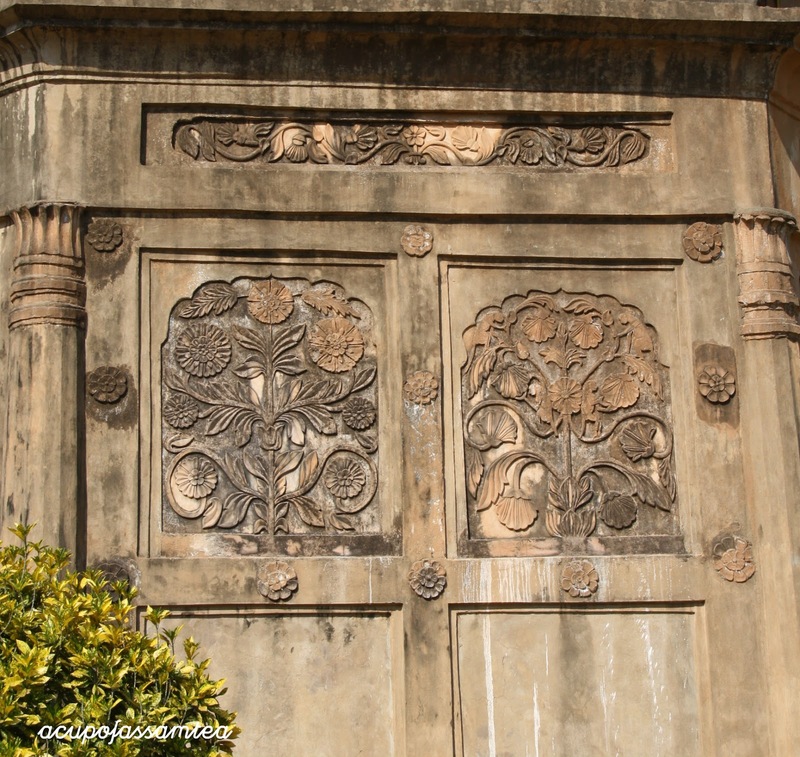 The Ranghar's construction has exciting facts as it is said that it did not use cement instead used sticky rice and Swan eggs. 4. 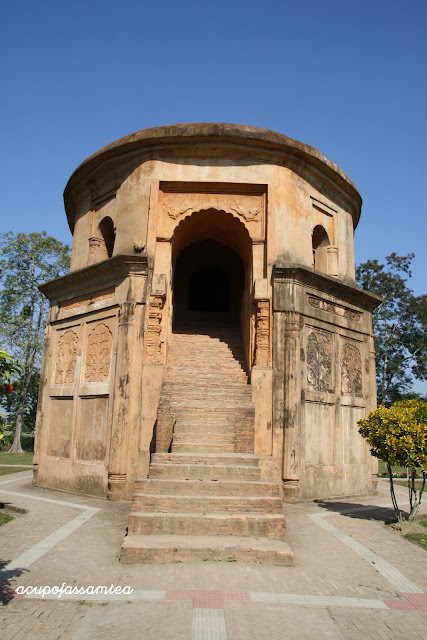 Tolatal Ghar - Just 2 miles away from the city, the Tolatal Ghar is a seven-storeyed palace with four-story above the ground and three underground. Talatal Ghar was used as an army base in Ahom kingdom. Its construction started in 1751 and was completed by 1769. 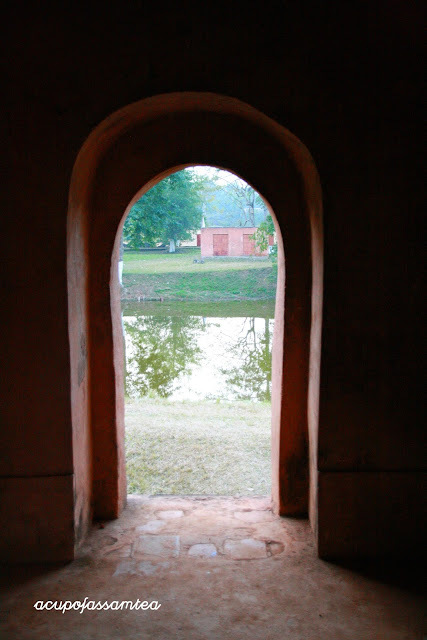 It has two secret tunnels connecting to Dikhow river and Garhgaon palace, used as an escape route in case of enemy invasion or emergency. You can end your day with a view of the magnificent sunset from Talatal Ghar. What to buy in Sibsagarh - Since you spent the day in Sibsagar, you can't be back empty-handed. 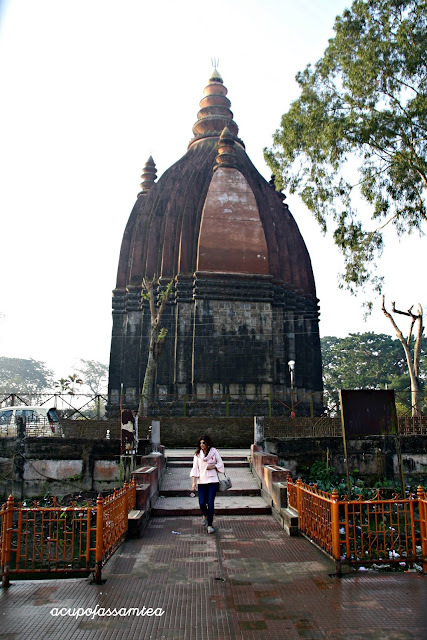 Sibsagar is known for handloom and handwoven traditional. You can pick silk scarf, saree, mekhela chadar and many more from local shops. Humble tribute to Sridevi and her top 8 favorite movies. 1. Chandini (1989) Directed by Yash Chopra, blockbuster hit Chandini is a romantic saga. Chandini means Moonlight. Just like aesthetics of moonlight, Chandini is aesthetic delight sensitivity and beauty. Sridevi was a delight in this film. Her looks remain as a trendsetter even after a decade. 2. Mr. India. (1987) Mr. India was Anil Kapoor's film, but we can't imagine Mr. India without Sridevi and her comic timing. Her power pack performance was the fulcrum part of this sci-fi and thriller movie where she played a crime reporter called Seema. Who can forget the song Kate Nahi Katte". 3. Lamhe (1991) . Portrayed two character mother and daughter Lamhe remains Sridevi's one of the splendid performance. The transition from mother's charter to daughter is immaculate. The film shot in Rajasthan and London is a roller coaster romantic saga where she won the 37th Filmfare award for the best actress. 4. Khuda Gawah (1992) Here she coupled with the B'towns Superstar Amitabh Bachan. Lavish and romantic epic Khuda Gawah, Sridevi pulled it with panache and elan and acute acting. Never to be missed. 5. Chaalbaaz (1989) Yet again here she played two twin character separated by birth one Anju another Manju. Anju quite and calm and Manju seasoned and savvy she lived up two characters in one film with great captivating comic timing and dodge dancing ability and her inevitable acting brilliance. 6. Sadma (1983) After a car accident injured head a young woman regresses childhood and story of her aloof teacher. One of Sridevi's most beautiful performance with countless cinematic moments. 7. English Vinglish (2012)One can't imagine after a gap of 15 years from celluloid she came with such grace and elan. Yes, this was Sridevi's come back film. Sheer soulful performance and every woman can relate to that permanence Sridevi with her emotional best one of the most feel-good movie. 8. Mom (2017)Unfortunately this was the last film journey before her heavenly abode. Where she proved, she could pull a film without a great screenplay. She played a mother and teacher with her up spontaneity and gifted acting aptness.